Making use of quantum phenomena like entanglement a quantum-internet can bring a revolution in communications. Researchers around the globe are trying to develop technologies that will allow to send qubits between two locations. Such qubits can take the values ‘0’ and ‘1’ just like ordinary bits, but can also take both values at the same time. This is called a superposition of the two states ‘0’ and ‘1’. And they can be entangled: their states are then dependent on each other, measuring the one of the two will instantly affect the state of the other one. Hence in the quantum world we have long-range correlations of quantum information! A quantum Internet will have unique properties that classical computers can never have. The first property is that using entanglement we can perfectly coordinate activities taking part in distant locations. We could for example perfectly synchronize two clocks being located anywhere on the globe! Think of a 100m sprint race, you could have eight sprinters ready to start in eight different countries and give them a perfectly simultaneous start and finish! A second impressive property is that quantum connections are inherently safe to use for communication. If two qubits are fully entangled, then it is impossible to intercept this connection. This property makes entanglement suitable for applications that require safety and privacy. As mentioned earlier, on a quantum internet we have quantum computers sending quantum bits, hence you may wonder how can we build a quantum internet at the moment we don’t fully understand how to build functional quantum computers. Well, this is the ultimate goal we would like to achieve, fully-fledged quantum computers that can exchange an essentially arbitrary number of qubits. Thankfully, it turns out that many quantum network protocols do not require large quantum computers to be realized: a quantum device with a single qubit at the end point is already sufficient for many applications. The reason why quantum internet protocols can outperform classical communication with such relatively modest resources is due to the fact that their advantages rely solely on inherently quantum properties such as quantum entanglement, which can be exploited already with very few qubits. In contrast, a quantum computer must feature more qubits than can be simulated on a classical computer in order to offer a computational advantage . In the following video a short introduction to the quantum internet by Stephanie Wehner. Stephanie Wehner is Antoni van Leeuwenhoek Professor in quantum information and the Roadmap Leader of Quantum Internet and Networked Computing. She is part of the Quantum Internet Team at QuTech, Delft University of Technology. The most well-known application of a quantum internet is quantum key distribution (QKD), It enables two users to produce a shared random secret key known only to them, which can then be used to encrypt and decrypt messages. 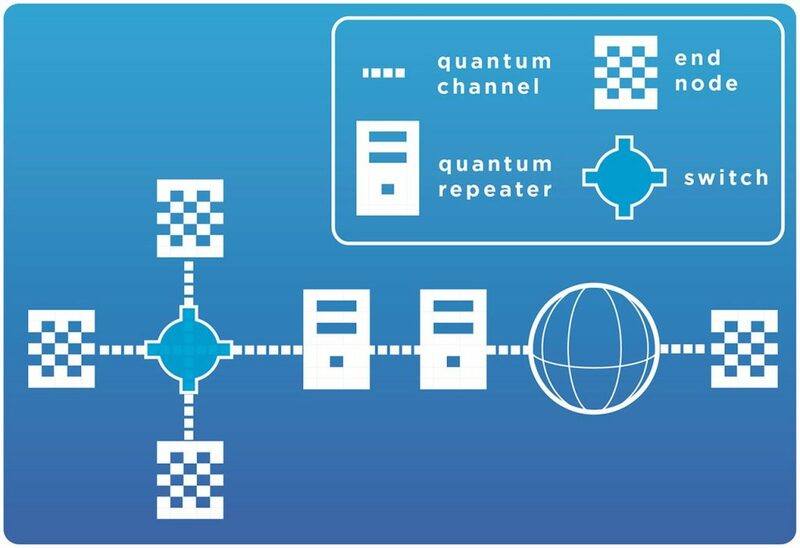 An important and unique property of quantum key distribution is the ability of the two communicating users to detect the presence of any third party trying to gain knowledge of the key. This results from a fundamental aspect of quantum mechanics: the process of measuring a quantum system in general disturbs the system. A third party trying to eavesdrop on the key must in some way measure it, thus introducing detectable anomalies. By using quantum superpositions or quantum entanglement and transmitting information in quantum states, a communication system can be implemented that detects eavesdropping. In order to realize quantum communication new concepts and technologies are necessary. 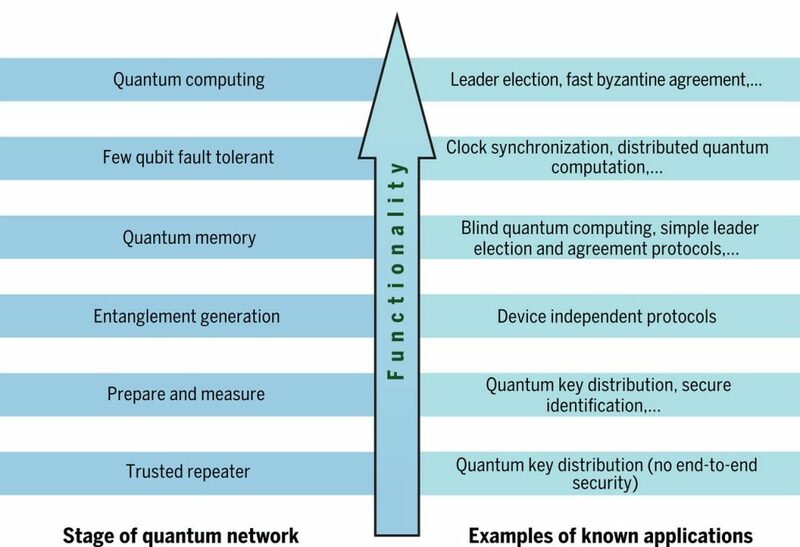 Stable qubits and quantum computers are technologies that are necessary in order to build a fully functional quantum network. But there is more infrastructure needed in order to realize a quantum internet. A quantum internet consists of three essential quantum hardware elements. First, we need a physical connection (quantum channel) that supports the transmission of qubits. Examples are standard telecom fibers as they are presently used to communicate classical light. Second, we need a means to extend these short distances. Quantum channels are inherently lossy. Long distance communication is hindered by the effects of signal loss inherent to most transport mediums such as optical fiber. In classical communication, amplifiers can be used to boost the signal during transmission, but in a quantum network amplifiers cannot be used since qubits cannot be copied – known as the no-cloning theorem. That is, to implement an amplifier, the complete state of the flying qubit would need to be determined, something which is both unwanted and impossible. Hence, in order to reach longer distances, intermediate nodes called quantum repeaters are necessary. Such a repeater is placed at certain intervals along the optical fiber connection, in theory allowing qubits to be transmitted over arbitrarily long distances. 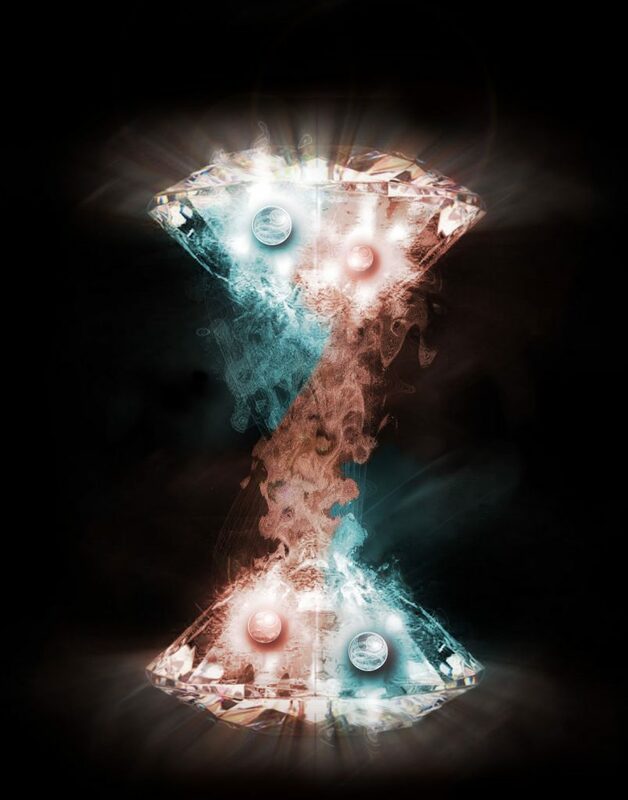 The final element are the end nodes, that is, the quantum processors connected to the quantum internet. These may range from extremely simple nodes that can only prepare and measure single qubits, to large scale quantum computers. How does such a repeater work? A repeater can only be used to perform quantum key distribution with the additional assumption that the repeater is trusted. Consider two end nodes and , and a trusted repeater R in the middle. A and R now perform quantum key distribution to generate a key . Similarly, and run quantum key distribution to generate a key . and can now obtain a key between themselves as follows: sends to encrypted with the key . decrypts to obtain . then re-encrypts using the key and sends it to . decrypts to obtain . and now share the key . The key is secure from an outside eavesdropper, but clearly the repeater also knows . This means that any subsequent communication between and does not provide end to end security, but is only secure as long as and trust the repeater ! In this case we talk of a trusted repeater! In a recent article that appeared in Science the authors review what it will take to achieve this so-called quantum internet and propose stages of development that each correspond to increasingly powerful applications, see [8,9,10]. Although a full-blown quantum internet, with functional quantum computers as nodes connected through quantum communication channels, is still some ways away, the first long-range quantum networks are already being planned. We expect that this classification will be instrumental in guiding and assessing experimental progress as well as stimulating the development of new applications by providing a common language and reference frame for the different scientific and engineering disciplines involved. Figure 2: Stages in the development of a quantum internet. Each stage is characterized by an increase in functionality at the expense of greater technological difficulty. The figure is taken from . These stages are functionality driven: central to their definition is not experimental difficulty itself, but the essential question of what is needed to actually enable useful applications. Each stage is interesting in its own right, and distinguished by a specific quantum functionality that is sufficient to support a certain class of protocols. Crucial to the distinction between the stages is that the subsequent stage offers a fundamentally new functionality not available in the previous one, rather than simply improving parameters or offering “more of the same” by increasing the number of qubits. For each stage, the authors describe some of the application protocols that are already known and that can be realized with the functionality provided in that stage . Figure 3: Stages in the development of a quantum internet, each stage will bring us one step closer a fully functional quantum internet. The figure is made based on . The key to a successful quantum internet will be the ability to generate robust entanglement between distant quantum memories. Unavoidable interactions with the environment, however, generally result in the loss of entanglement. Recently the research group of Ronald Hanson in Delft in collaboration with researchers from Oxford managed to describe an entanglement distillation protocol that could be used to enhance the purity and robustness of entanglement between quantum nodes of a primitive quantum network. “ We are going as a science into new areas. This entanglement distillation is essential for the future of the quantum internet: where many quantum connections exists that should also be of high quality”. Figure 4: an artists representation of two entangled states shared between two diamonds. A key ingredient for the realization of entanglement distillation. Taken from qutech.nl or . Also important for the future of the quantum internet is quantum synchronization. An important application of quantum synchronization is to provide effective quantum correlation for quantum information processing. In a previous article we describe the relationship between quantum synchronization and entanglement. The phenomenon of quantum synchronization on complex networks have so far remained almost unexplored. In the recent work  a first step is made by finding an optomechanical implementation, which is shown in the figure below. 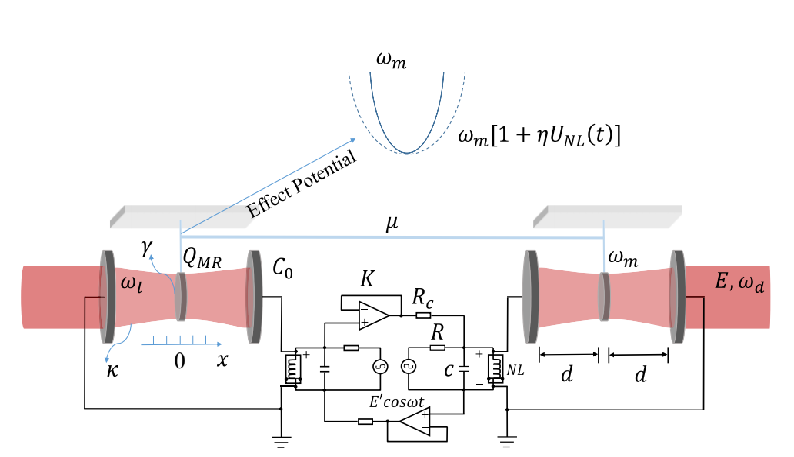 Figure 5: this design allows us to obtain quantum synchronization between two completely different oscillators. This design allows us to obtain quantum synchronization between two completely different oscillators. In the figure above the cavities are the carriers of the quantum states. The electro-optomechanical systems are coupled via phonon tunneling and a linear resistor. The Fabry-Pérot cavities contain a charged oscillator which couples with the cavity via a linear optomechanical interaction. Circuit coupling controls subsystems that eventually reach the same effective frequency, which means two subsystems evolve under the same dynamic equation. If this is accomplished, the phonon coupling will offset the initial phase difference between the systems. In  many details are provided that show how well quantum synchronization is actually established. Measures like the fidelity show that only in the case, when the systems are both coupled classically and quantum mechanically genuine quantum synchronization can be demonstrated. The next challenge is to extend this synchronization to more general complex networks. So far this has only been checked for relatively small networks, but the results are very promising. For example, it was found in  that in small world network consisting of only 12 nodes, synchronization is easily achieved and the fidelity can stabilize at 100% for very long times. Moreover, it turns out that even when the topology is changing with time identical states can be transmitted in this network, without need for additional controls, which is a feature that is highly beneficial for quantum communication. In this case one effectively describes the quantum state sharing as interdependent communication between two network nodes. This is no longer true for scale free networks where additional control mechanism are required as the whole network needs to be synchronized at the same time, that is, a scale free network describes an information diffusion process. Witthaut, Wimberger, Burioni and Timme, Classical synchronization indicates persistent entanglement in isolated quantum systems, Nature Communications (2017). A. Galindo and M. A. Martin-Delgado, Information and computation: Classical and quantum aspects, Reviews of modern physics 74 (2002). H.J. Krimble, The quantum internet, Nature 453 (2008). Li, Li and Song, Quantum synchronization and quantum state sharing in an irregular complex network, Physical Review E (2017). N. Kalb, A. A. Reiserer, P. C. Humphreys, J. J. W. Bakermans, S. J. Kamerling, N. H. Nickerson, S. C. Benjamin, D. J. Twitchen, M. Markham, R. Hanson. Entanglement distillation between solid-state quantum network nodes, Science (2017). Stephanie Wehner, David Elkouss, Ronald Hanson. 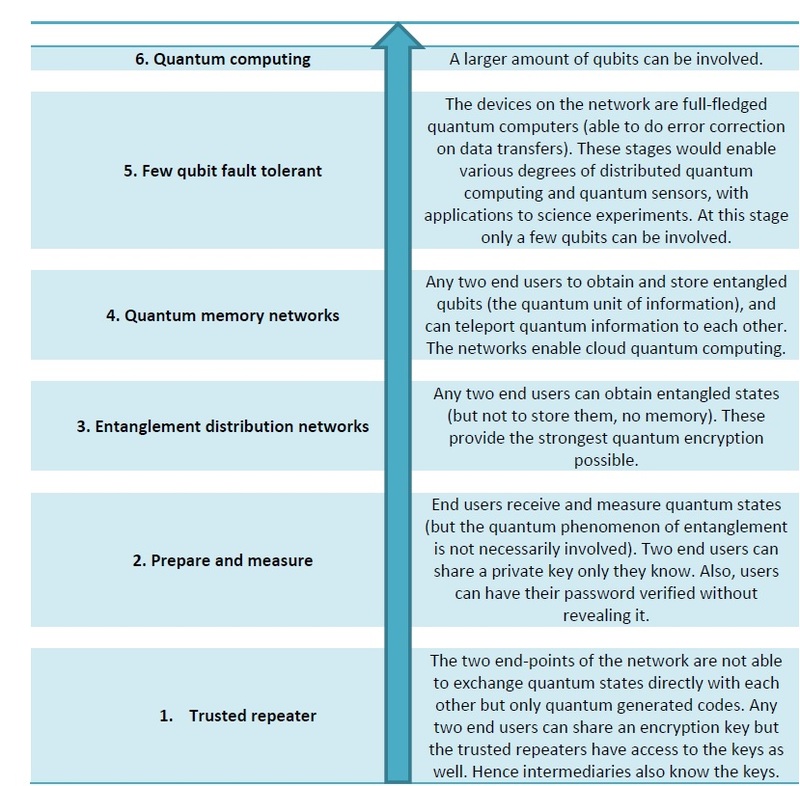 Quantum internet: A vision for the road ahead, Science (2018). QuTech onderzoekers presenteren roadmap voor quantum internet, TuDelft. Here’s what the quantum internet has in store, Nature (2018).